The Three Shires Way at Tathall End, Hanslope, Bucks Horse RidingThe Three Shires Way is a long distance bridleway which runs from Tathall End in Buckinghamshire, through north Bedfordshire and ends at Grafham Water in Cambridgeshire. The route traces the outline of ancient trackways and passes through a beautiful rural landscape, meandering through ancient woodland and historic villages with spectacular views. 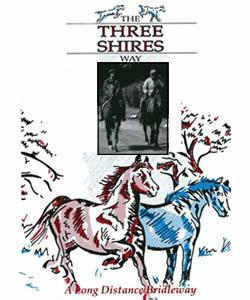 The route is signposted with the Three Shires Way logo. the Bridleway is 37 miles long in total and passes through Tathall End, Emberton, Lavendon, Knotting, Yielden, Shelton, Covington, Spaldwick and Easton before circling Grafham Water. Start/Finish Point: Start at the village of Tathall End. Start Nat GR: SP911560. The walk ends at Grafham Water in Cambridgeshire. The Three Shires Way is a long distance bridleway which runs from Tathall End in Buckinghamshire, through north Bedfordshire and ends at Grafham Water in Cambridgeshire. The route traces the outline of ancient trackways and passes through a beautiful rural landscape, meandering through ancient woodland and historic villages with spectacular views. The route is signposted with the Three Shires Way logo. the Bridleway is 37 miles long in total and passes through Tathall End, Emberton, Lavendon, Knotting, Yielden, Shelton, Covington, Spaldwick and Easton before circling Grafham Water. How to get there by car/Parking: The village of Tathall End, in north-east Buckinghamshire, lies approximately 5 miles north-west of Newport Pagnell. Take the B526 north from Newport Pagnell and turn left just after the village of Gayhurst.